The "figurative system of human knowledge", sometimes known as the tree of Diderot and d'Alembert, was a tree developed to represent the structure of knowledge itself, produced for the Encyclopedie by Jean le Rond d'Alembert and Denis Diderot. The tree was a taxonomy of human knowledge, inspired by Francis Bacon's Advancement of Knowledge. The three main branches of knowledge in the tree are: "Memory"/History, "Reason"/Philosophy, and "Imagination"/Poetry. 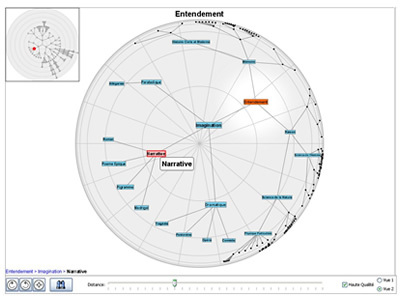 This dynamic map produced by Christophe Tricot, and developed in Java, is a novel interpretation of the original tree of knowledge. It's interactive fisheye view is one of the most engaging, smooth and intuitive techniques I've seen to interact and navigate complex hierarchical systems. It makes you think how interesting it would be to navigate Lombardi's networks this way. It's truly worth exploring. 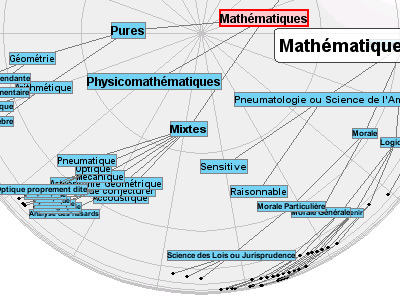 To see the original version of the "figurative system of human knowledge" tree (in French), click here.